Need information on Ordering items from Glimakra USA? Click here Glimakra USA works very closely with the GAV-Glimakra factory in Sweden. Glimakra-USA maintains a large warehouse in Eugene Oregon (largest in the world outside of the factory in Sweden) to better meet demand on a timely basis. In most cases, items ordered can be shipped the next day…including large floor looms and their attachments and accessories. We also maintain an inventory of Swedish threads, yarns and weaving kits. Visitors are welcome. So, if you happen to be in Oregon or Eugene stop by. Glimakra USA prides itself on doing more. 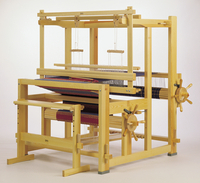 Glimakra Swedish weaving equipment follows a long line of proven construction techniques. Sturdy and functional design give you the equipment that works well and will serve for generations. Glimakra Products make your weaving easier and more comfortable. Ease of operation is a primary feature of our looms and products. 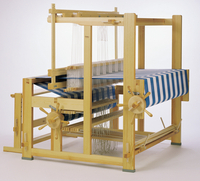 This web site contains a lot of information on weaving and looms from a glossary to detailed information for your use. Use the navigation menus on the top of the page and on the left side to help you find information on products, techniques and answers to questions. You can also use the contact information, request a catalog, get information on ordering and download a price list on the lower portion of the page. Have fun. Weave well.